Members can log-in to see details for this year's scholarship. 25th anniversary golf tournament a complete success! Watch out at all times for roadside workers. 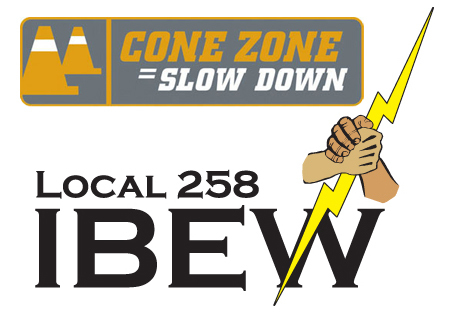 Local 258 IBEW members now eligible for UNION SAVINGS! Log-in to the website to find out more! April, 2019 - In 2018, the BC's Workers Compensation Board accepted claims for the deaths of 131 workers who were killed while at work. From www.ibew.org, Electrical Worker OnLine, December 2018 On the Front Lines The last few months have been trying times for IBEW members on the front lines of disaster. Hurricanes Florence and Michael on the East Coast and Hurricane Lane in Hawaii tested our linemen, groundmen and tree trimmers. December, 2018 - International President Emeritus Edwin D. Hill, a transformative trade unionist who modernized and shepharded his beloved IBEW through one of the deepest and most painful recessions in history, died Saturday, Dec. 1, 2018. He was 81. Read more about Ed Hill here. December, 2018 – Showing strong solidarity and support, delegates at the 58thconvention of the BC Federation of Labour elected Brother Laird Cronk by acclamation to serve a two-year term as the new president of the provincial labour body. Many thanks to all the Local 258 IBEW members who worked on this mega-project and took the photos and videos and to Brother Brad Masse for putting the video together. Products proudly made by IBEW members. Find out more about the CONE ZONE campaign to help protect workers in traffic control. Please respect the unions’ picket lines in these disputes. Do not patronize these businesses until the dispute is settled.